As southern food-loving North Carolinians, we'd all be lying if we said we didn't like Chick-fil-a. Something about their chicken is inexplicably good and keeps us coming back. I don't think it's humanly possible to be tired of Chick-fil-a, but one day last summer, I pondered the possibilities of delicious meals that could be made if Chick-fil-a offered more than just chicken. This sparked the idea of a lifetime. If you're an avid Chick-fil-a lover as I am, prepare to have your mind blown. I was fulfilling my weekly craving of some classic chicken nuggets around last July, so I drove to my local Chick-fil-a, got my usual 12 count combo and made my way home. Due to my lack of communication with my mom, I arrived home to discover she had already gotten a Michaelangelo's pizza. 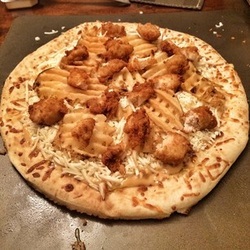 As I stood in the kitchen with my Chick-fil-a in hand and a beautiful pizza in front of me, I was struck by the amazing idea that had just come to my mind: Chick-fil-a Pizza. 1. Pre made pizza dough (or you can use an already made pizza like me). 2. Your choice of four individual sauce packets from Chick-fil-a (four is enough to cover the whole pizza; you don't have to spend extra on the pallets they offer) I chose Chick-fil-a sauce, but Polynesian is also a great choice. I set out all my food, grabbed a knife and cut my chicken nuggets and fries into tiny chunks. I spread a good layer of Chick-fil-a sauce to an individual slice of pizza, then added my chicken and fries. After that, I added shredded mozzarella on top and popped it in the microwave for around a minute. Since the pizza and chicken were already warm, I just used a microwave, but if you're starting from scratch you'll have to use an oven. The time had finally come to try my creation. One bite fulfilled everything I had expected; it was absolutely amazing. The combination of the dough, chicken, fries and sauce was perfectly balanced so you get a little bit of flavor from each element. One slice of Michelangelo's pizza with my Chick-fil-a remix was the perfect amount of food to fill me up, but it was too good not to have another slice. It's honestly hard for me to put into words how good this creation was, so I hope I've inspired you to experience this for yourselves. Happy eating!